Houseleek is a perennial European plant; the fibrous rootstock produces a thick rosette of fleshy, spinypointed leaves and an erect, round stem covered with small, scalelike leaves. The stem is topped by a cluster of starlike, rose-colored flowers during July and August. Cultivated and also grows wild in dry, stony soils, on walls, and even on the roofs of houses. The Greeks regarded houseleek, known as Strotgethron, as a powerful love philtre. The flowers were once thought to be unlucky and were usually cut off before they could bloom. 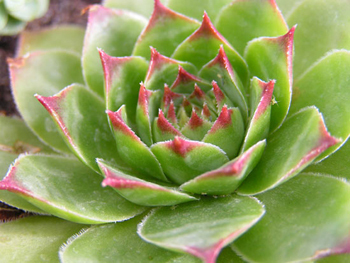 Once was common everywhere on garden walls and on the roofs of buildings, houseleek is now sold as a pot or rockery plant by horticulturists. Houseleeks traditionally come under the patronage of Jupiter (though in magic they belong to Venus) and were formerly known as Jove’s Beard (Jovis Barba). So strong was the belief in their ability to deflect lightning that Charlemagne ordered that every dwelling in his empire should have them on its roof. Fresh bruised leaves used for cooling application on the forehead during feverish illnesses, can be used for burns, insect bites, headaches, and other skin problems. The juice pressed from the leaves, used as eardrops, or the leaves themselves sliced in half, used for warts, corns, freckles, ringworms, boils, bruises, ulcers, erysipelas, and other skin blemishes. An infusion of the leaves used internally, or a decoction used externally, for shingles, hemorrhoids, worms, and uterine neuralgia, rubbed gently on nettle stings or bee stings to take away the pain. Infusion or decoction: use 1 tsp. leaves with 1 cup water. Take 1 cup per day. Tincture: take 5-20 drops at a time. Also, can be applied to warts, ringworms, and skin blemishes.